Effusion and Diffusion are very similar. Diffusion is the movement of particles or molecules across one or more barriers with tiny holes in it. Effusion is a simplified type of Diffusion. That is, effusion is the movement of particles or molecules through only one hole between only two containers. Here is a video demonstration. Regardless, you do not really have to know any of that to succeed in this section. The equation for how fast (the rate) that effusion happens is below. The equation is what is important. Sqrt stands for SQUARE ROOT OF. MM stands for MOLAR MASS OF.This formula says that the rate of effusion or diffusion of a gas depends on the square root of its molar mass. That suggests that lighter gas effuse or diffuse slightly faster. These are not absolute rates. Meaning they are not always the same rate for a particular gas in any conditions. Rather they are relative rates. They are only a comparison of these two particular gases at these particular conditions. It is like saying a Lamborghini travels twice as fast as a Ford. In that comparison of cars I did not actually say how fast each of the cars were going. Instead, I compared them to one another. This formula is doing the same thing to gasses. If you try the numbers in the formula it says that He gas travels or effuses at twice the rate of CH4 gas. We will try this exact problem later as a demonstrated example. Be careful with this formula. Many people are fooled into writing this formula incorrectly or plugging in the numbers in the wrong spot because how the formula is written does not match how they are thinking of it. This will become clearer in the demonstrated examples. Examples: Solve for the following effusion problems. Use this periodic table link to look up the molar masses. If the rate of effusion of H2 gas is 15. What is the rate of effusion of N2 gas? If you have an unknown gas that effuses at a rate 2 times that of F2 what is the molar mass of that gas? How much faster is the rate of effusion of O2 gas to that of CO2 gas? VIDEO Effusion Demonstrated Example 1: If the rate of effusion of Ne gas is 5. What is the rate of effusion of Cl2 gas? 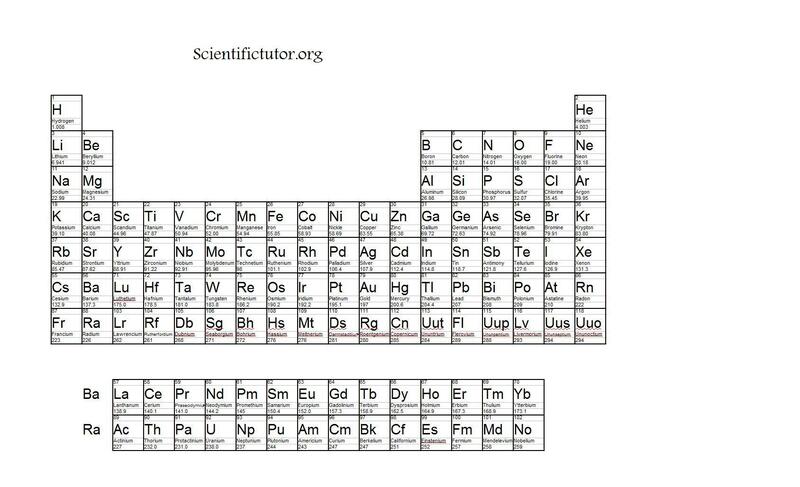 Use this periodic table link to look up the molar masses. Answer: Rate of Cl2 = ? Answer: Multiply both sides by Rate of Cl2(red). Cross out Rate of Cl2 on the left side. Answer: Multiply both sides by Sqrt 20 and Divide by Sqrt 71 (red). VIDEO Effusion Demonstrated Example 2: If you have an unknown gas that effuses at a rate 3 times that of Br2 what is the molar mass of that gas? Use this periodic table link to look up the molar masses. Answer: Molar Mass of Unknown = ? Answer: Multiply both sides by Sqrt MM Unknown (red). Cross out Sqrt MM Unkown on right side. Answer: Divide both sides by 3 (red). Cross out 3 on left side. How do I do the calculations to help further simplify? Square both sides causing the elimination of the square root on the left. VIDEO Effusion Demonstrated Example 3: How much faster is the rate of effusion of He gas to that of CH4 gas? Use this periodic table link to look up the molar masses. Answer: Because this is a ratio we can solve for both. Rate of CH4 = ? Rate of He = ? How do we simplify the math? PRACTICE PROBLEMS: Solve these effusion problems. Use this periodic table link to look up the molar masses. If the rate of effusion of N2 gas is 20. What is the rate of effusion of F2 gas? If you have an unknown gas that effuses at a rate 2.3 times that of Cl2 what is the molar mass of that gas? How much faster is the rate of effusion of H2S gas to that of Ar gas?